“When I was in bootcamp my grandfather broke me out for a weekend to go to Chicago. It was amazing.” says Steve Morici. This is immediately cooler than anything that’s happened to me between the age of 18 and, well, right now. “My grandfather enjoyed sports cars. He had a number of Jaguars…In the 40’s he started going to the Indy 500, I think that’s where I got the bug for Indy.” I nod, my cool quotient diminishing rapidly. We’re sitting next to Steve's 1963 Cooper T67, ostensibly discussing its history, but at this point in our conversation, I realize that we’re really talking about life and cars. I guess it would be more accurate to say that we’re talking about life WITH cars…racing cars. And like so many racing enthusiasts who wrench on their own machines, Steve’s healthy obsession has a clear line going back, in his case, all the way to his grandfather. What is also clear is that he cares about this lineage not out of some silver spooned pride, but rather from an indefinable joy at father and son, grandfather and grandson forging bonds at the track and in the garage. I’m perched on the back end of a spare, white metal trailer, it’s rugged patina offset by the shiny newness of the Ford pickup out front. On the wooden deck, a chartreuse tent has been erected. It looks like the nylon has been dyed with baby food; maybe you can live in it then eat it. The whole setup looks unlike something you would see on an Abercrombie and Kent safari. But who cares; a vintage Cooper sits five feet away. Some wrenches, a hammer and other tools sit next to me, ready to be pressed into service after each set of laps is dispatched by the little T67. This trailer then is Steve’s bedroll at the track and the Cooper’s residence on the road when the racer climbs behind the wheel of his F150 headed for home in Wrightwood, California. Needing to check the water level, retorque bolts and perform sundry other checklist items before making another run on track, Steve stolidly sets about his business still clad in his racing suit. Meanwhile my photography partner, Jeff, and I line up shots of the Cooper and dig into it’s history with him. I’m not paying much attention to what he’s putting a wrench on, but I can see work progressing sure and steady. Steve is nothing if not methodical, a reassuring steward of this piece of British history. Nor is he a guy overly concerned about the lap times of every other sometime track driver around him, or his social position amongst those same people: the wealthy owners of patinated European automobilia which roll on and off bespoke 50’ trailers at tracks around the country. Rather, he enjoys life’s journey to each Moment, which right now is cluttered by us, our cameras and questions on this unexpectedly brisk, overcast September day. Low clouds scud across the upstate New York sky, on their way to the coast. Here in Watkins Glen the cold grey atmosphere provides a stark backdrop to the brilliant blurs of color blatting through storied parts of this great track: the Esses, the Chute, and the Boot. This is a place where the greats have run. Clark, Hill, Stewart, Lauda, Donohue, Andretti, McLaren, no first names necessary. But right now there is only Steve, the T67 and us and we’re here to talk history. Seriously though, it’s pretty damned cold. In 1958 the FIA introduced the Formula Junior class in an effort to bring about entry level competition to open wheel racing. In a “race what you brought” set of rules, engines, gear boxes and brakes had to come from production cars, and exotic components such as limited slip diffs and overhead cams were verboten. Engine size was restricted to either 1000 or 1100cc depending on car weight. Out of England’s primordial mechanical ooze and elsewhere cottage builders sprang up producing an array of open wheel Juniors which competed in a series dominated early on by no one. In 1960 over one hundred manufacturers (lots of shed builders) from Canada, Australia, the US, Germany, Italy, Russia and elsewhere supplied racers. But the relatively staid Formula Junior’s success was soon noted by the big British motorsports brands, all of which began fielding racers. Though the independents struggled in the face of new, experienced competition, by 1963 there were nearly five hundred FJ car builders. Think about that for a moment. FIVE HUNDRED companies, partnerships and utterly unhinged individuals built cars to compete in what was meant as an entry level class for young drivers. The handwriting was on the wall though. The series was doomed as the one-offs and tiny builders’ specials were unable to inexpensively extract the power and reliability necessary to beat the likes of Lola, Lotus, Cooper and Brabham. Outspent, the little guys folded and after a mere five years the series was no more (In America it continued for one more year.) Formula Junior then was an early cautionary tale writ large on the track. If this sounds familiar, take a look at the mordant condition of Formula One currently. With the exception of Kimi Raikonnen taking the Australian Grand Prix for Renault in 2013, just three constructors have won every singleF1 GP race in the last five years. As I write this the Japanese Grand Prix is taking place and rest assured unless everyone at Suzuka contracts rickets before it finishes the race will be won by either Mercedes or Ferrari…there’s a $500 bet on the table if you want to take it: but I digress. As the sun set on the series’ existence, Steve Morisi’s Cooper T67 FJ (likely #14) was built and fielded as one of three works cars for the 1963 season, to no particular acclaim. It sported a BMC 1100 motor and Citroen box with Jack Knight gears. I would love to tell you that Stirling Moss conceived his first child in it while racing to victory at Donnington, or that Phil Hill ran the Cooper down the Strand after a hard night of drinking at Claridges, but it didn’t happen. It was in fact a garden variety Formula Junior with no glorious history - beyond racing during one of the coolest eras of motorsport in history. Because no production plate sits on the fuselage, sussing out its background has been a cat and mouse game for many years, so its post bespoke career remains a bit hazy. Steve informs me that according to the verbal history retold by a mechanic associated with the Cooper, it ran in some F1 Grand Prix races - you know, the Big Game. “Promoters wanted to…have bigger fields so they allowed these other cars to run in non-points races,” he intones. In a less restrictive time, smaller GP events needed full grids as some top drivers stayed home. Thus non-Formula 1 cars could be altered to fill the bill. Nor were they slouches on the track. “Those Formula Juniors were really quick,” Steve notes. “A good example was up at Mosport. I was up there in June and there was a Cooper and it was clocked at 130 miles per hour.” Suddenly the idea of Juniors mixing it up with their older brothers doesn’t sound so farfetched. Beyond its flirtation with the senior formula series, it’s believed that his car had a single downdraft carburetor fitted to compete in Formula 3. Records on the car are still being researched, so there are only degrees of certainty beyond what is a sound verbal history. Thankfully, the Cooper didn’t end up in the glue factory. “They didn’t just throw these cars away,” says Steve. And so in 1972, nine years after its manufacture, a 1.5l motor was dropped in and the Citroen box replaced by a Hewland. The car then competed for another ten years in sprint races and those fantastically pukka, British hill climbs. All over Europe and elsewhere, lovely Brabhams, Lolas, and Coopers were similarly flogged in all manner of events before rolling into retirement. What came out of the ashes of Formula Junior then, were racing cars--lots of them. Let’s put the brakes on the Formula Junior side of the ledger for a moment and dig into Steve Morisi’s backstory. Because, as you’ll see, without that, somebody else now owns the Cooper T67 and I’m out of a writing gig (feel the suspense?). Clearly this is important stuff. The biting winds and forbidding skies of Saturday have passed out to the Atlantic overnight, and Steve and I are enjoying a perfect sunlit afternoon. As we talk on The Glen’s infield, a mix of big block Corvettes roar through their final runs of the weekend, to be followed by small bore sports cars. A couple of MGA’s burble past us headed for the grid. Trailing the second car, two mechanics/friends/groupies give chase, frantically yelling and waving wildly for their guy to stop--or maybe they just like running and waving. Whatever, he makes a right and rolls on. Steve relaxes in a camp chair next to the trailer talking about his adolescence. Listening to him talk it seems like kismet that the Cooper has found a home in this unassuming man’s garage. It’s workaday history dovetails with Steve’s well, for he knows what toil is, having spent decades in the building trade in California; just as the Cooper spent many years climbing hills in England without the fanfare of the more grandiloquent Ferrari and Mercedes sports cars or Formula One combatants. Surely it takes money to own one of these racers, but in Steve there isn’t a hint of arrogance, of entitlement. He’s just enjoying the experience. Having regaled me with an adolescent life story that makes the parachute pants and going-to-the-mall lifestyle I had seem like so many bad choices, we thankfully turn to the T67’s recent history in America. Many FJ racers still intact (or even partially so) after their competitive careers ended, were sold on or stored, rebuilt, tweaked and fettled and mostly kept in good shape. Steve’s Cooper was no exception. In the early 80’s it found its way to the US. Then hisfather parted with a Lotus 23 in 1984 in a trade with a fellow racer which gained him the T67. The same year it won a medal at Road Atlanta with Steve’s father at the wheel. 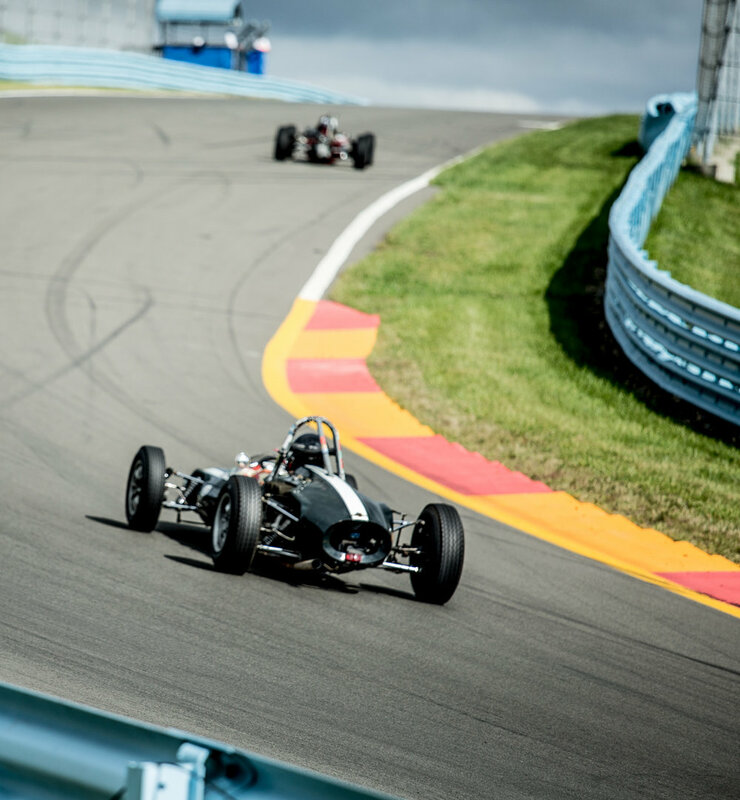 Continuing on the vintage car circuit, the Cooper competed at the 30th anniversary of Formula Junior races at Mid Ohio and in the nineties, won a Pittsburgh Vintage GP. Steve coveted the open wheel racer for many years and let his father know if he ever wanted to unload it, Steve was the guy to whom it should go. After much cajoling and prodding (Steve didn’t tell me this I just like the sound of it), his dad handed over the reigns of the Cooper to his son and this love affair between a man and a car was born. Cue angels and harps. Over time a mechanical restoration took place and Steve chose Lime Rock in 2009 for its first run. The next race up was a special one. “I took the car to Mt. Equinox with my dad,” he says. “My dad brought one of his cars… and [he] and I did (the hillclimb). It was a really neat experience.” I don’t know about you but that sure as hell completes the circle for me. Steve and his father rally when he’s a teenager and four decades later they’re still racing together, each in his own car. Since that time, Steve has continued to shuttle around the country entering events at many of the great race tracks. From his home in the high desert of Southern California, he prepares his racer for treks which span the continent. Because of his overflowing good will and interest in preserving the sport, Steve, along with twelve other owners, cofounded the “Formula Junior Historics of North America” in 2012. This group brought people from across the country to compete in events and swap stories. They now have about one hundred members from the US, Canada and Mexico and have developed an annual FHJNA National Race, which is scheduled each year at a different track. Steve modestly tells me the race at Lime Rock Park in 2014 fielded thirty one cars, the largest gathering of Juniors at a race since 1989. So the organization continues to bring cars to the track, giving spectators and racers alike the chance to enjoy these rolling pieces of history. Happily, not just the usual suspects show up, as many one-offs and weirdsville specials fly around the track. Sadler, Elfin, Dolphin, and my favorite, the Jocko Special, are all represented alongside their more known British and Italian counterparts. It’s well worth your time to watch these pieces of history scrabble around the track. If you’re lucky enough to see Steve and his Cooper in an infield (look for the yellowish tent), introduce yourself and have a chat. He’s a great guy. In the throes of writing this piece I give Steve a call. There are a few things I needto clarify and frankly I enjoy listening to history presented by a man who’s still kind of living it. After we ring off he texts me his thanks for telling the story of his historic car, butalso with a final thought. “Race car collectors…call ourselves the caretakers of these wonderful vintage cars and we know some day someone else will be the caretaker and we want the history to go along with them,” Steve muses. “The written history is very important. The photos and stories kind of tie everything together.” In his case the next caretaker will keep it in the family. “This car will never be sold. I have four sons and one of my sons is gonna get this car.” In Latin the term vocare means “to call”; it is the basis for the idea of “spiritual calling” and is an appropriate descriptor of how Steve Morisi views his time with the Cooper. His youngest son in an expression of vocare will enter his first race this year in a Formula Ford barn find, chalking up another generation of Morisi car obsession. My hope is that Steve will have a boot camp breakout for his grandson, pushing it to five generations caught up in that irrational but wonderful love affair. Chris Gorman is one half of 1 and 9 Commercial Photography, along with partner Jeff Schmale. Based out of Baltimore, the duo shoots people, sports, things, and more.